Our partner Bandwidth has alerted us that there is potentially a problem with the password security of EdgeMarc Gateways and Session Border Controllers (ESBC). This might affect all EdgeMarc device owners. In short, the default Username / Password of “Root” / “Default” of these devices have been compromised. 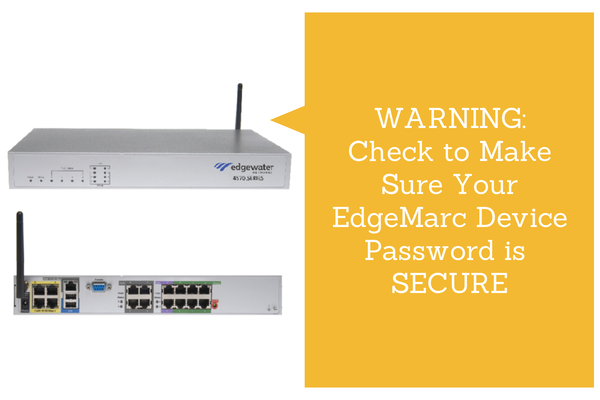 However, if you changed your log in credentials when you programmed your EdgeMarc device then you are probably safe. If you were never prompted to change the default username / password you may not have thought to change it. In the EdgeMarc GUI, under ‘System’ click on “Client List”. If there are any entries listed other than known and local IP addresses, there is a strong possibility that your device has been compromised. To resolve, remove the offending IP address. Disable PPTP (Point-to-Point Protocol) – Under PPTP server > Username, ensure there is no user built unless it is a known user. Disallow WAN clients – Under VoIP ALG, uncheck both the ‘allow clients on WAN’ option, as well as the ‘Enable LLDP’ option. Note: Some EdgeMarc screens within the GUI save changes while you’re making them, and others require you to hit a ‘submit’ button. Please take note of this while making your changes. Thank you to Bandwidth for bringing this problem to our attention. If the above information did not help you and you still have concerns, please call us at 800-398-8647.